Those who turn on the tap for a drink at Naval Base Kitsap-Bangor in 2020 will get water that includes fluoride. The Navy is in the process of installing a water fluoridation system at Bangor to comply with a Department of Defense directive issued in 2013, said base spokesman Jake Chappelle. That year, the Office of the Undersecretary of Defense mandated that all military installations serving more than 3,300 personnel through their own water treatment facilities install the systems. Bangor has 9,000 military and civilian personnel on base. Then-Assistant Secretary of Defense for Health Affairs, Dr. Jonathon Woodson, advocated for the institution of such a policy, since “providing optimally fluoridated water at DoD installations helps to improve and sustain the military readiness and health of military personnel,” Chappelle said. “Current research and scientific evidence shows that providing optimally fluoridated water directly reduces the risk of dental decay,” he said. The federal Department of Health and Human Services recommends a level of 0.7 milligrams of fluoride as the optimal level in drinking water. It will cost a little more than $447,000 to install the system. It will not be operational until 2020 because of the required training and hiring of system operators, Chappelle said. No other Naval Base Kitsap installations currently have or are planned to receive the fluoridation systems, because they do not meet the Department of Defense’s base-size requirement of serving 3,300 personnel with a water system. Joint Base Lewis-McChord has fluoridated water systems. 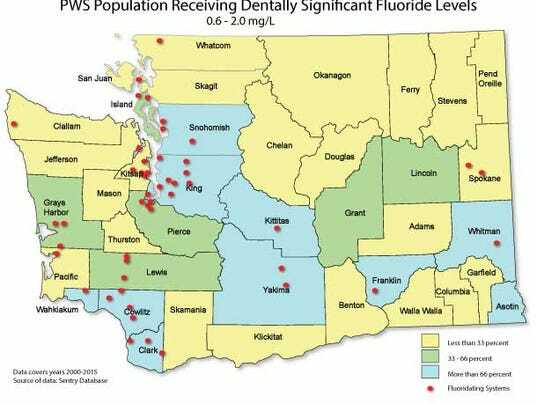 Kitsap County has one of the highest numbers of fluoridated public water systems in the state, according to the state Department of Health. Water systems with fluoride include the cities of Bainbridge Island, Poulsbo and Port Orchard; Bainbridge’s Rockaway Beach Water; the Manchester Water District; and Port Orchard’s West Sound Utility District #1. Residents of the city of Bremerton voted down a proposal to fluoridate the water in 1999.